“In my painting for WOW x WOW’s ‘Lightning Bolts & Little Sparks’ I assembled a cast of allegorical characters, the main character being a ‘Frog King’, a floppy figure, almost puppet-like, fallen by exhaustion or laziness. I’m not sure if there is even someoneinside the costume. Despite his coloration being different from the grouping, he is a secondary focus. He is the king, but he is slumped and below the group, almost an afterthought. His retainers are made up of a giant observing eye, girded in armor; A machine-like thing that seems to hover on an array of bubbles, releasing hot air and whose face is only a vented orifice; A happy small human in royal garb; and a masked cartoon-like character skulking in the background, with a sardonic expression. The background is a forest of forbidding tentacle-like forms. The painting was influenced by ‘The Wizard of Oz’ and the thesis that it was a political allegory of the Williams Jennings Bryan Presidential campaign of the late 1890s, which advocated popular democracy and favored a silver standard over the gold standard. Though not direct replacements with the characters of Oz, I sought to create a similar vein and feel. Chris was born in the San Francisco Bay Area. He began his art education at The University of California at Berkeley and then later at the Academy of Art in San Francisco. After which he served an apprenticeship with the master Italian painter Roberto Lupetti. 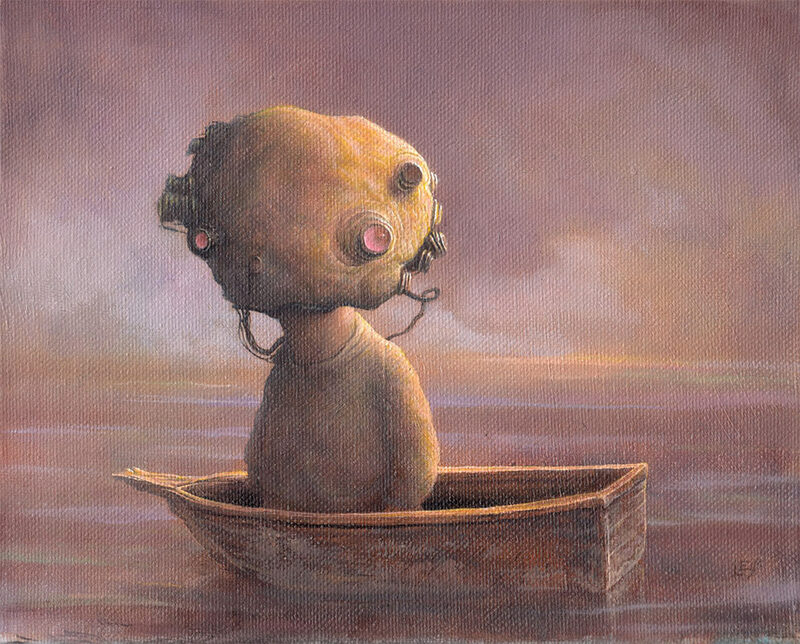 Chris Leib has exhibited his artwork across the United States, as well as in Germany, France, Denmark and Australia. A classically trained painter, Leib has spent over a decade applying renaissance techniques to subject matter outside traditional boundaries. Despite their dark tones, his subjects are characterized by humor and an exploration of heroic imagery. Leib’s art has been positively reviewed in the San Francisco Examiner, Kunst Magazin (Berlin), Hi-Fructose Magazine, Huffington Post, Supersonic Electronic, WOW x WOW, BloPop Magazine, Creep Machine, Beautiful Bizarre, and an upcoming feature in HEY! Magazine (Paris) to name just a few. Leib has twice been an Artist in Residence at the De Young Museum in San Francisco and has received competitive grants from the George Sugarman Foundation and the San Francisco Arts Commission. Leib’s work can be found in important public and private collections in the United States and Europe, including the corporate collections of the San Francisco Chronicle Newspaper Corporation, McDonalds Corporation, Academy of Art University, Structure Tone Inc. NYC, and TH Brokers NYC, among others.